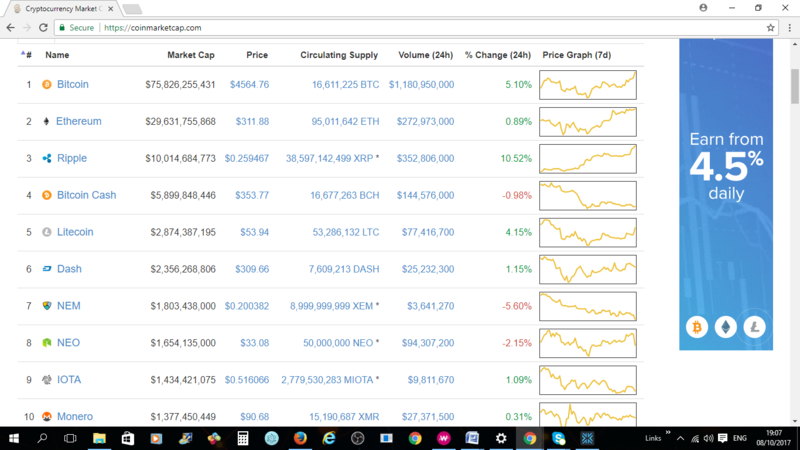 Good feeling is coming back to the market cap. After hearing from Chinese authorities that within a short time number of their national exchange will be able to trade, the market has increased its speed in recuperating itself. It seems that the money is coming out of other coins and is going back to bitcoin with a final objective of passing $4500 and get to $5000 price soon. There is a big possibility that if there is no negative news next week we could see that to happen. Today I read about the number of Bitcoin ATMs which are rising in Russia and there are some governments which are interested in regulating the business which are dealing with bitcoin and not bitcoin itself. One thing we have to bear in mind is that still bitcoin price has to adjust itself even though it might reach $5000 and over. But first, there is needs of an increase in trading in the market so that new money can be invested between different coins and create more possibilities. During this month we should look forward to bitcoin gold and number of ICOs token which will be included in the market cap. Fresh new events are going to take place during this month which could lead to new doors to be opened to more and more interested parties in cryptocurrency and for time being this the major objective to achieve.